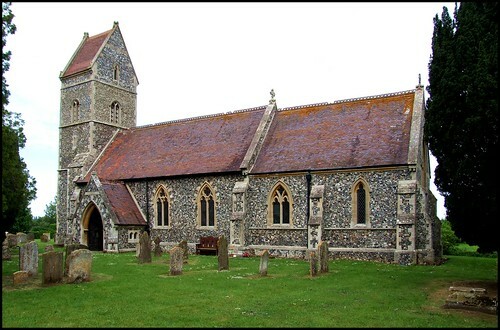 Seen on a map, East Wretham wasn't promising: the village sits on the busy Thetford to Kings Lynn road, and the church is close to the edge of the battle training area. But in fact the graveyard is lovely, at the end of a long lane, with a water meadow stretching away to the north. As we stood there looking out across it, we heard what would be the last cuckoo of the year, his voice already breaking. St Ethelbert is a curious sight: and, again, not a promising one. The saddleback tower is most un-East Anglian, prompting Tom to emit an involuntary sigh of disapproval. The tower is clearly intended to echo the Norman style, but its true origins are revealed by an inscription on the western face which records that the church was rebuilt in 1865 for the Birch family. The architect was George Street, and the tower was probably influenced by his rebuilding of that at Castle Rising the previous decade. He had also recently built a neo-Norman church at Roydon near Kings Lynn, and the style was prompted here by the Norman south doorway, the only survival of the medieval church. Norman was not Street's favoured style, but in fact the body of the little church against this tower is probably his best work in all East Anglia. Once you step inside it, you re-enter his favoured world of 13th Century Europe. Further, Wyrley Birch, Street's patron, was that unusual thing in Norfolk, an early Anglo-catholic, and over the next twenty years or so he furnished Street's church in a predominantly 14th and 15th century style, creating an illusion of continuity that is so often missing from 19th century churches. He provided stained glass of the highest quality, mainly by Powell & Sons and Clayton & Bell. The best of this is the triple light window of the Holy Kinship, depicting St Elizabeth with St John the Baptist, St Anne with the Blessed Virgin, and St Mary Salome with St John and St James. The feature which catches the eye first is the magnificent font cover, a near-replica from the 1880s of the early Perpendicular cover at Elsing. The eye is led eastwards to the intimacy of a chancel wihich seems to float, the polychromatic frescos of angels giving a sense of impending Anglo-catholic twilight and incense. In the north aisle, the side chapel is a pretty altar with a riddel screen, like something out of a Sarum textbook. The short life of this building has known some bitter conflicts, and a brass plaque here remembers Hugh Travers Rowley, who was one of more than 20,000 young men slaughtered on the first of July 1916, during the storming of the German lines on the first day of the Battle of the Somme. Rowley was 23 years old; his father was Herbert Seddon Rowley, the Rector of East Wretham. The Rector's son was a Captain in the Royal Berkshire Regiment, and was probably one of the first boys to die that day: the Berkshires were in position close to the front line where a British mine exploded prematurely at just before half-past seven that morning. Forced into action early, the lads of B company had reached the front German trenches by ten to eight: but, by then, more than three hundred and fifty of the eight hundred who went over the top twenty minutes earlier were dead. Rowley's body was never found. He is remembered on the Thiepval Memorial to the Missing, along with 70,000 other boys. On a sill on the south side of the church sits the original grave cross of Lietenant RA Noble, killed in action exactly a year later, on the first of July 1917. These crosses marked the places where those whose bodies were found were buried during the conflict, usually in a hurry, and they all tend to be different, curious examples of folk art in extreme circumstances. When the graves received more permanent markers after the war, and in many cases the bodies were moved to new sites, the original crosses were made available to the parishes back home. Many survive to this day. Most are poignant reminders of a time now out of sight, and in many cases are our only touchstone. Lieutenant Noble, however, is also remembered here by a massive neo-classical stone memorial a few feet away. It was designed by Lutyens, and tells us in some depth that Marc Noble was the beloved younger son of Saxton and Celia Noble of Wretham Hall. He was wounded near Ypres, and died later the same day. He had just passed his twentieth birthday. Of the Wretham Hall that Marc Noble knew there remains little trace. It had been rebuilt by Sir Reginald Blomfield when Noble was a child, but during the Second World War it found itself on the wrong side of the fence of the battle training area. It was demolished in the 1950s. Beside its lumps of brick and concrete are the remains of the medieval tower of St Lawrence, West Wretham. The only older memorial here was brought from there.